This stock shows that the best stocks are rarely cheap but always worth the investment. In the depths of the Great Recession, many people thought Whole Foods (NASDAQ:WFM) was done for. I didn't agree with those folks, and I backed that assertion up two years ago -- when I pledged to buy $4,000 worth of Whole Foods stock for my retirement portfolio. Over that time frame -- especially given yesterday's earnings beat -- the stock has performed exceptionally well. My original investment is now worth $6,612, or $1,540 more than if I had invested in the SPDR S&P 500 ETF. WFM Total Return Price data by YCharts. Today, I'm going to spell out why Whole Foods remains as must-have holding for my retirement portfolio. One of the most disturbing side effects of the industrial revolution is that people like you and me became completely disconnected from where we get our food. That oversight is now front and center in many Americans' psyches -- as diabetes and obesity rates reach alarming levels. That helps explain why the market for organic food has been on fire for the past 15 years, and doesn't show signs of stopping anytime soon. Source: Organic Trade Association. CAGR = compound annual growth rate. All numbers in millions. Think about these numbers for a second. For as much press as healthy food gets, and as much space that's been cleared for organic foods in traditional grocers, it still only made up 4% of all purchases in 2010. Even if organic food is destined to only make up 20% of our diet in the future, that's still a fivefold increase from the penetration it was at a little over two years ago. Whole Foods stock stands to benefit tremendously from this, as the company only has 349 of its expected 1,000 stores open in North America, and has the strongest brand when it comes to organic food. "Whole Paycheck" -- that's the moniker many give the grocer because of its high prices. But if we were really to compare apples to apples, we'd see that's not necessarily the case. When it comes to the price of organic food, Whole Foods isn't outrageously priced at all. Earlier this week, I went to grocery stores in my northern Chicago neighborhood to do some research. I visited Whole Foods, along with Dominick's, Mariano's Fresh Market, and Jewel/Osco, which was recently sold by SUPERVALU to Cerebrus Capital Management. When I performed this experiment two years ago, Whole Foods had a much bigger lead over Dominick's. But Safeway (UNKNOWN:SWY.DL), which operates the Dominick's chain, made a conscious decision to go head-to-head against Whole Foods in the increasingly popular organic-food segment. With its O Organics brand, Safeway has been better able to compete against the natural-foods giant. Meanwhile, Mariano's is relatively new. It's operated by Roundy's (UNKNOWN:RNDY.DL), representing that company's attempt to move beyond its more traditional grocery stores to try to capture its share of the organics and natural-foods market. So, it's pretty clear that Whole Foods isn't expensive comparing apples to apples. But even if other grocers are catching up, they lack the singular focus that Whole Foods does -- and that makes it such a strong brand among conscientious shoppers. From my visits to these stores, I can tell you that the selection of organic products is far greater at Whole Foods. The company also goes above and beyond to let consumers know exactly where products came from, and the environmental impact they have -- from food to laundry detergent. 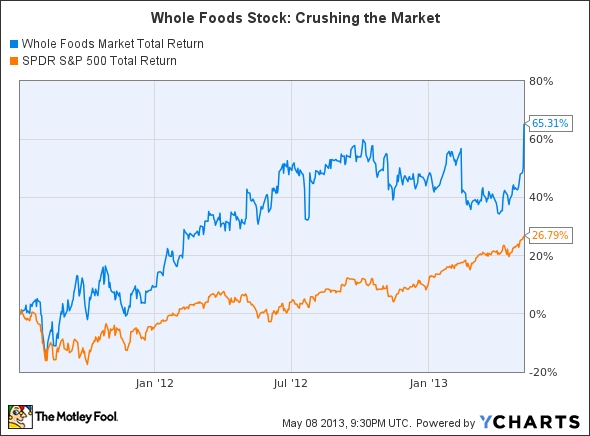 It is that type of differentiation that leads me to believe Whole Foods is a stock to buy and hold for the long term. There's no doubt that, given a P/E of 37, shares of Whole Foods aren't cheap. But the best companies almost never trade for cheap. If you're convinced that Whole Foods stock belongs in your portfolio, I suggest investing a little now, and buying more as you get to know the business better.